Hey everyone in the galaxy! Today I have a post for you all that I haven’t really had before, a guide. A while back I had my first blog anniversary and with a deadline the same week, no special celebration really happened. However, it got me thinking about what I can bring back to you guys after having been a book blogger for over a year now and so this book blogger guide was born. It is just as much for beginners as it is for veteran bloggers. To summarize, it’s basically just some tips, tricks and reminders for all of you book bloggers out there among the stars. I hope you’ll find it helpful. A as in Advanced Review Copies, ARCs. It’s sort of fitting that ARCs is the first thing we’ll discuss in this guide. Most book bloggers want advanced review copies to read and review early on their blog. There are multiple ways to go about this, some easier than others, but I’ll try to give you my best. If you are a beginner my advice is to start on a website called NetGalley. This website is easy to navigate and easy to get started with. You simply sign up, write a bio and start requesting advanced review copies. When you just start out it can be hard to get approved for books since publishers tend to look at statistics of how well you send in reviews for books you’ve been given (but you’re new and don’t really have that). However, a good idea is to keep on requesting books anyway and also checking out the “Read Now” titles since anyone can read those. Eventually, you’ll get approved and be able to get a higher percentage on your profile. Out of all of the ways to get ARCs, I think this one is the easiest, especially if you’re just starting out. There are of course other ways to get advanced review copies as well: directly through the publisher, through authors contacting you or through Edelweiss+. I have not used Edelweiss a lot to request books, and truthfully they’ve not yet accepted any books for me there, however, I keep on trying anyway. Edelweiss also recently updated their website, and if you’ve used the website before (unlike me), then I can imagine it’s an adjustment. However, I really like the new layout and think it’s pretty easy to navigate after playing around for a while. Their customer service is great and you have nothing to lose by trying to request ARCs there as well. A secret I’ve read about which can up your chances of getting accepted on there is to crosspost your reviews on Edelweiss. Unlike on Netgalley, you can upload reviews on Edelweiss for books you haven’t received an ARC for. Just search for the title on the home page (most titles both old and new are on there) and upload your review once you find the book you’re looking for. That way publishers can easily see your work on the website and it might make them more inclined to accept you in the future. As I mentioned earlier, you can also get ARCs through emails in two different ways. The first way is that authors or publishers find your blog, like your reviews, and email you with a review request. You can’t do a lot to help with this except blog continuously and make sure it’s easy for people to find where they can contact you. Usually, the bigger your blog gets, the more review requests you get. However, you can also contact publishers yourself. There are lots of bloggers who have written about how to go about this, a simple Google search will help you. However, I have a few quick tips for you. If you know of a book you want to read and review early you first of all need to find out which publisher the book has. After that, go to their website and find the appropriate imprint and person to contact. Usually, they make it very clear who to contact, but a safe bet is the marketing department or similar. Then you just send them an email with information about yourself, the book you want to request and which format of your book you are willing to review. That’s about all I know when it comes to Advanced Review Copies. B as in Blog Hopping. If you want to make friends, get more traffic, and read what other book bloggers write about then one thing I really recommend you do is blog hopping. If you’re a beginner that phrase might be new to you but what it means is that you go from blog to blog (you hop between blogs) and read, and comment on, other bloggers’ posts. If you have WordPress a simple “like” on a post can be enough to show appreciation of it but to truly get to know more bloggers then commenting is the way to go. Something I personally want to get better at is just setting a specific time of the week just for blog hopping since I tend to easily forget to do it. Either way, it’s really fun to interact with others who do the same thing as you do and see what creative posts they’ve come up with. To make book blogging more fun and interactive blog hopping is the way to go. If you run a book blog I think consistency is something that’s good to remember. Consistency means different things depending on the posts you publish but basically, it’s all about trying your best to keep your promises to your readers. If they expect you to post on Mondays then try to do that to the best of your ability (however, you’re only human so it’s not something to get stressed about, just think about). D as in Diverse Books. If you are in the book community then you need to know about the organization We Need Diverse Books. The organization’s mission is, according to their website, “Putting more books featuring diverse characters into the hands of all children.” You can read more about their vision, mission and their definition of diversity here. I believe in the importance of marginalized readers being represented in books. For too long, books have had nothing but white, straight and otherwise privileged characters in books with either no diverse characters at all or just token characters that exist not to give representation but to fill a quota or to further the white characters’ growth through their misery, death or otherwise problematic subplot. Diverse books enrich our world, the book community, and marginalized readers’ lives. If you are a book blogger, my advice to you is to read as diversely as you can. You can do that in so many different ways, but my tip is to look at people that have recommendation lists for books that represent different minorities. Make sure to broaden your reading list to include a large variety of identities and intersections. You can find a broad list of diverse recommendations on We Need Diverse Books’ website here. I also have a few Goodreads shelves with recommendations. Here is my shelf for books with authors of color, books with LGBTQIA+ characters, and Jewish characters. However, these lists are in no way complete or the only books to read if you want to read diversely. 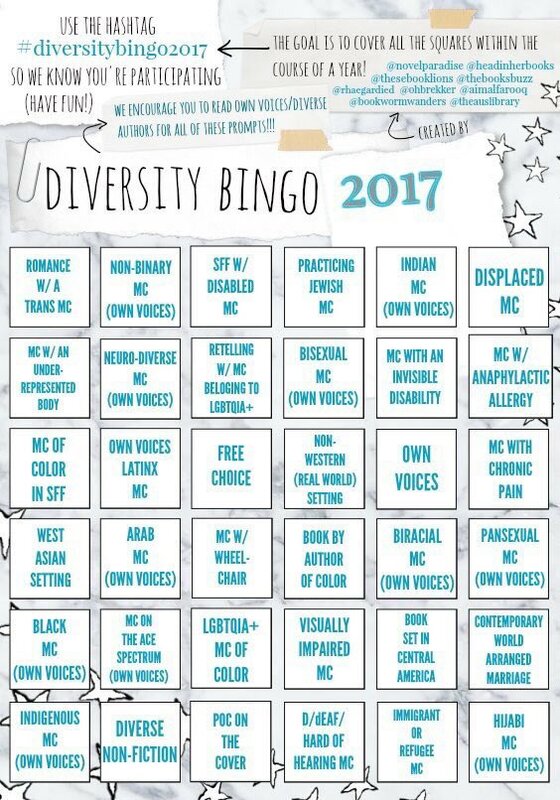 If you want help to read more diversely you can also participate in #DiversityBingo2017 which was started by a group of people on Twitter. All of the information about this book challenge and the people who started it can be seen in their graphic. To see book recommendations for the challenge you can search for the hashtag on Twitter. Multiple bloggers have made recommendation lists for the bingo challenge. There is always a way to read more diversely and you should aspire to read books that represent the world the way it actually looks like and represents people who are everywhere around you in the world. If you’re a book blogger I really advise you to get an email address for your book blog. First of all, if publishers and authors want to contact you then you need a way for them to contact you. You could use a personal email but since it’ll be online I think it’s the best if you create a new one just for your blog. I made this mistake but soon realized that the bigger my blog gets, the more emails I get, which is why I want to separate my personal emails from my blog emails. You can, for example, get a new email on Hotmail, Gmail, or Yahoo. This tip is one of my most important ones in this guide. Book blogging is a lot of work and is as demanding as a part-time job which means you need to have fun when blogging. Even if you just started blogging or have been blogging for a long time, you need to remember that you’re blogging for yourself and that what you’re doing is ultimately free labor. Make sure you’re having fun while doing it and if it’s not fun, take a break or switch things up. The secret to all blogging is that it needs to be fun or you’ll eventually get too stressed out. If you are a reader you may or may not have heard of this amazing tool and website called Goodreads. Goodreads is a website that is so helpful when you’re a book blogger. You can put books on virtual shelves to keep track of them and also review them. Goodreads is a website a lot of reviewers use and a tool I wouldn’t trade for the world. I can track all books I’ve read and when I’ve read them. I can also sort my books into shelves based on genres, release year, the age of the characters, and representation. I would definitely recommend you to get Goodreads to make friends, put your reviews up, get book recommendations and track your books. H as in getting Help. If you are a blogger then you need to remember that if something isn’t working for you, or you can’t figure something out, don’t forget that getting help is not bad. The book bloggers I know are amazing and kind and if you ever need blogging tips or just general help then don’t hesitate to ask. Fellow bloggers tend to always help each other out. I know for one that you can always contact me with anything on my contact page or on my Twitter. In the book community there are book bloggers and then there’s Instagram and Bookstagrammers. Instagram and the community that has been created there, called Bookstagram, is basically a branch of the book blogging community. So what is it? Basically, it’s bookish people posting pictures of their books and writing their thoughts about them. Personally, I’m not that good at it but I know so many people on there that post the most beautiful pictures of books that ever existed. If you love taking pictures of books, then this is a great way to create a following on more than one platform and get your bookish thoughts and pictures in more places than one. J as in blogging is a Job. Here’s something you need to remember when you’re a book blogger, being a book blogger is a job and it requires constant work. There is no going around this if you blog regularly you’re also working regularly. Yes, blogging is a hobby but it’s one that shouldn’t be taken lightly. There will be times when you’re stressed, and us book bloggers have your back if you need it, but it’s a reality that you need to be aware of. However, remember that taking a break or a holiday is totally acceptable and a great way to destress from all of your blogging. Here’s a little blogger secret, nobody in the blogging world knows everything. Lots of bloggers make guides and give tips, tricks, and whatnot because we have experience. However, we all just try to do our best with the experience we have and in the end, no way is the right way. No matter if you’ve just been blogging for a week, a month or a year you can just do your own thing and hope for the best. Do your thing to the best of your ability and try whatever it is you’re doing until you succeed. L as in Library (+ Free Books). You’re a book blogger and you want to review books, however, money is an issue. Don’t fret my friend, if you have a library close to you then remember that it’s never wrong to borrow books to read and review. That’s support too and it’s just lovely if you have one nearby. Now I’m aware that not everyone has a library close to them, and though I can’t change that, I can give you another tip. There are a) online libraries that you can search for b) Amazon has a feature that means you can borrow ebooks from friends if they own a book you want to read and c) Amazon often has deals on books which mean they’re either free or very cheap. Be on the lookout for those if you have a hard time getting books in any other way at the moment. I’ve gotten a lot of books this way. M as in Marginalized Voices. Earlier in this guide, I discussed diverse books and why they’re so important to the book community and the world, but you can’t mention diverse books without mentioning marginalized voices as well. When diverse books and problematic books are discussed you need to listen to marginalized voices and boost them. Ultimately these books will affect marginalized people the most and that is why their voices are so important. I can’t tell you who to follow, it’s all about looking at which voices you see are being boosted when important discussions are happening. I could provide you with a few lists that have been created by other bloggers where they list marginalized bloggers, however, these lists aren’t always complete, updated or comprehensive so I think the smartest thing is to just be on the lookout when you’re searching for new blogs to follow. Moreover, when talking about marginalized voices the importance of books written by marginalized authors needs to be mentioned as well because no matter what they write about they usually struggle the most in the publishing world. Marginalized authors’ voices are so important and need to be highlighted. If you’re a book blogger (or if you’re just a reader, to be honest) then novellas are something I really recommend reading. When you’re in a slump or just want something cheaper then novellas are such a nice alternative to full books. They’re shorter, usually cheaper and great when you need something different for a change. I really recommend them. A keyword for any book blogger is organization. It will ultimately make things easier for you even if you’re not really a planner, especially since what you decide to organize is up to you. My number one tip for you is that when you have time over to write blog posts, write as many as you can and schedule them for the future. Life happens and that means it’s not always that easy to sit down and write blog posts every week and that’s when scheduled and/or prewritten posts are amazing. They’re already done and you can spread them out over a long period of time which is the most convenient thing ever. I honestly love it. Another thing you might need to organize is your advanced review copies. When your blog gets bigger you also often have more ARCs you need to juggle which means setting a TBR or a plan for when you need to be done with a specific book in order to have time to write a review for it. I use a digital calendar on my computer to stay organized and to remember when I have reviews due and when I want to set away time to write new blog posts etc. However, a really great way to stay organized is through this free printable book blogger planner Gabi @ Let’s Gab About Books made which you can download here. It’s so pretty and a perfect tool for book bloggers who want a little help to stay organized. P as in Problematic Books. The importance to recognize and call out problematic books goes in a lot of ways hand in hand with the importance of diverse books which I discussed earlier in this guide. The truth is this, problematic books hurt people. If you are a blogger you need to be aware of the fact that problematic books exist and if you see a book being problematic you need to make sure to highlight that so others can find out. Everyone has their problematic favorites, but books that are racists, homophobic, ableist, antisemitic, transphobic and other -isms and -phobias will hurt marginalized readers. If you are a privileged person (and yes almost everyone has privileges in one way or the other) then it’s possible you can’t spot these things like another marginalized reader can. That is why it’s important to listen and boost others when they call problematic books out and then try to learn to see the red flags in books for yourself. How can you do that? By listening, by always trying to do better and to examine yourself if you find out one of your favorite books is problematic. What did you miss? How did you miss it? Like with all things, some problematic books are far worse than others and I can’t really explain what’s what there. It’s all about being respectful and humble when others are telling you why a book is problematic because what they’re doing is giving you a free education which they really don’t have to do at all. Make sure you realize how much value there is in free education and thank the one educating accordingly (a thank you is always great, spending money on their Kofi or similar is even better). At times blogging will feel hard and maybe even miserable and you’ll think “I want to quit this thing” and you know what, that’s okay. I think a lot of book bloggers have felt this way, some more than others, and that’s a totally okay feeling. Blogging isn’t always easy and you don’t have to pretend it is either. If you ever feel like quitting, do it, if you feel like taking a long break then remember that it’s totally okay. Your health and wellbeing is the most important part of all book blogging. An important part of book blogging, especially if you want to get ARCs, are the reviews. Your reviews can have any structure you want, they can be formal or not formal, include gifs or not, or just be filled with quotes. I have a specific structure for my reviews but you can choose to do whatever you want. A good idea, however, is to include the book’s cover, purchase links and perhaps a link to its Goodreads page. A tip to find high-quality book cover pictures is to go to Google Images, press the tool button and change the size to large, then search “[book name + author name] cover” and save one of the pictures that show up. If you want some tips about stuff you can discuss in your reviews then here are some: you can write about the plot, the characters, the writing style, how the representation was done and if the book was funny, sad or both. You can also mention if you think that book needs a trigger warning or if it made you fangirl a lot. Anything you want is good to go since your review style will probably be as unique as you are. Another good idea for your blog is to start a review index so that people that visit your blog can easily find all of the books you’ve reviewed. S as in Social Media. With book blogging there comes a thousand different social media accounts to handle on top of just your blog. However, using social media also means it’s a lot easier to get your blog posts out to people. I’ve already mentioned Goodreads and Instagram earlier in the guide but there are so many other websites you can use as well. My favorite social media is by far Twitter, the book community is so amazing there, especially when you follow the people I’m following. It’s a great way to find other bloggers. Other social media platforms bloggers tend to use is Facebook, Amazon, Pinterest, Tumblr, and YouTube. Amazon is great because posting your reviews on there actually helps authors a lot, so when you have reviews make sure to always crosspost your reviews on there. There’s also YouTube where the book community has created a community of people that review books and talk all things bookish by posting videos of themselves. They call themselves booktubers and there are some really amazing people on there. T as in Top Ten Tuesday. Top Ten Tuesday is a weekly meme created by The Broke and the Bookish. This meme is great when you want to make new friends and participate in a meme at the same time. Every week there’s a new theme for you to create a list to publish on your blog, and then you can also see how other book bloggers interpreted the same theme. You can see the themes for the next few weeks here and see previous themes there as well. When I was a new book blogger I loved participating in Top Ten Tuesday and got a lot of new book blogger friends and followers through participating. There are a thousand book blogs so try to remember to be unique. How do you do that? First of all, just be yourself. There is no one else like you out there, so try to make your personality really shine through in your posts. You’re great, let your followers know it too. To be unique in other ways, try to come up with blog posts and series that no else has featured on their blog. You can take inspiration from all aspects of your life and make your blog your own, just mix interests, colors and whatever your mind can think of. If you are a blogger you probably want visuals on your book blog. So be it pictures, graphics or other things to make your blog and blog posts more unique, interesting and entertaining. You can make your graphics either on a program called Photoshop or on a website called Befunky. The latter is free and very easy to use, it’s what I used to use before I got photoshop. As for pictures to use, you can find free pictures and whatnot at the following websites: Freepik, Beautiful Dawn (they have a list of resources of free pictures) and FTextures. These are all great alternatives for free pictures. There is also the option of googling “free pictures” or “free textures” on Google Images. Moreover, if you want cool and unique fonts for your graphics and visuals you can download free ones on DaFont and 1001 Free Fonts. Widgets are a great way to make your book blog more organized and easier to follow. For example, social media buttons on your blog sidebar are a great way to make it easier for followers to follow you on all of your platforms. You can find free social media button to download here, they exist in 100 colors. On WordPress, you can search for a lot of widgets in the same place where you customize your theme. However, if you have another blog host then a good idea is to google for potential widgets to use. Don’t forget to have a very visible follow button on your blog to make sure people don’t have to look for it. A search bar and perhaps your blog categories are also great to have on your sidebar as a widget. To end this book blogger guide I want to, first of all, send you guys hugs and kisses while at the same time remind you all that book blogging is all about the love of books. That is what book blogging is all about and it’s really the only thing you need. If you love books and you love your blog then everything else will work out. Never forget that fellow book blogger. I hope you found this book blogger guide for both beginners and veteran bloggers helpful. I tried to be as comprehensive as possible, however, I’m just one book blogger in a sea of thousand so always make sure to check more resources than one if possible. Great post! I just started blogging this month, so this was SUPER helpful! Thank you! This is a great post! I had so much fun reading through it and it must have taken a while to come up with everything and writing it all down so kudos to you!